If you'd like to make a large dataset available on Koordinates.com but you don't want to upload the entire dataset manually to our website, then you can upload your data via URL. Publish your data archive on a publicly available link - for example, as a ZIP archive on a publicly available website. Koordinates can scrape data from .ZIP, .7z, .TAR, .tar.gz, .tar.bz2, tar.xz data archives. You’ll be given the option of uploading either directly from your hard drive, or from a URL. Select Add data via URL and paste in your URL. Then, select Add data. 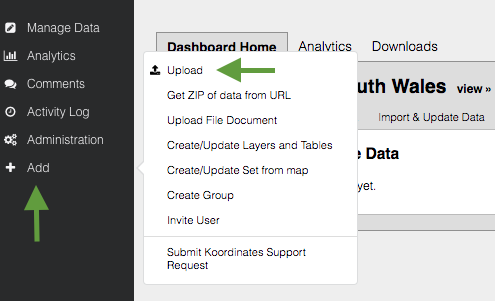 Koordinates will then automatically upload your data archive from your designated URL.